Identifies the Isle of the Blessed or St. Branden's Island west of the Canary Islands and postulates a communication between the Niger and the Nile. Carte de la Barbarie de la Nigritie et de la Guinee. 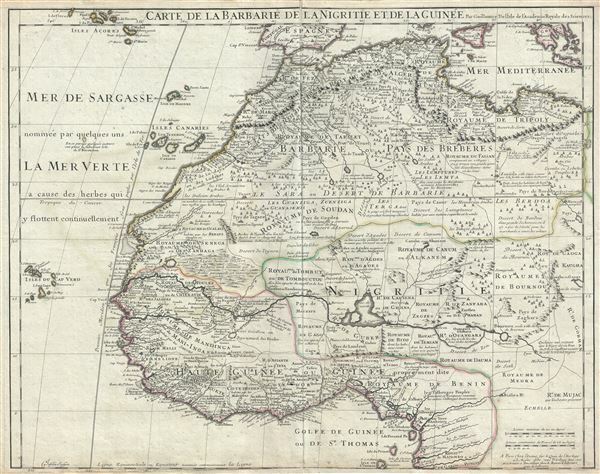 This is an excellent example of Guillaume De L'isle's influential 1707 map of western Africa. It covers the Barbary Coast and the Kingdoms of Fez, Tunis, and Tripoli southwards to the Gulf of Guinea and the Bight of Benin. The whole offers extensive detail on the tribes and kingdoms of central and western Africa, noting numerous groups based upon both firsthand accounts from explorers, slave and ivory traders, and missionaries, as well as speculative hearsay picked up by these same groups from the African indigini. Of particular interest is De L'isle's curious mapping of the Niger River which includes a great lake, called Lac de Guarde or Lac de Sigismes formed by the Niger - an embryonic attempt to map the important and unusual Niger Inland Delta. The river, moreover, runs directly eastward rather than correctly to the northeast. De L'isle's Niger eventually peters out in the Royaume de Medra rather than correctly turning southwards to rejoin the Atlantic in the Gulf of Guinea. There is, nonetheless, a fascinating annotation that postulates a connection between the Niger and the White Nile, a popular theory then circulating in French geographical circles. This map also includes the Azores, the Canary Islands, and the Cape Verde Islands. Just west of the Canary Islands, the phantom island of Borondon is presented. Better known as St. Brendan's Island, Borondon appears in texts as early as the 9th century. According to the legend, St. Brendan was an Irish monk who, along with his confederates, sailed westward into the Atlantic in the hopes of evangelizing to undiscovered island peoples. Some claim that Brendan made it all the way to Newfoundland in the 6th century, on the way discovering his namesake island. Traditionally the island is located to the west of the Canaries, where it is called the 'Eighth Canary Island,' and it appears only to the Blessed, earning it another name, 'the Isle of the Blessed.' The present map offers one of the best presentations of St. Brendan's Island in any obtainable antique maps. This map was engraved by Inselin and published by Guillaume De L'isle in 1707. It appeared in various composite atlases as well as various editions of the Atlas de Geographie. Very good. Minor wear and verso repair along original centerfold. Original platemark visible. Lower margin extended.